James Waller (Mr. J. Waller) is not to be confused with John Gough Waller (Mr J. G. Waller), also a longtime leading Sydney business figure, and fellow member of Sydney Philharmonic Society, who was born India, 1820; died Sydney, 1903. I have found no evidence that they were related. WILL be performed THIS EVENING, the 27th May, 1842. The Overtures and the whole of the Music, expressly arranged for full orchestra (which, by the politeness of Colonel French, will include the Band of the 28th Regiment) by Mr. Nathan. SOPRANOS AND TREBLES. Madame Gautrot, a Young Lady (whose friends have favoured Mr. Nathan by permitting her to sing in public on this occasion only), the Misses Nathan, Miss F. Pettingell, the Misses Sullivan, Miss Ellison, Miss Jones, Miss Mears, Miss Lynch, Miss Riley, Miss Tuohy, Miss Cochlen, Miss Riely, Master Allen, Master Richards, Master Riley, Masters Tuohy, Master Nathan, and the Masters Weavers. Monsieur Gautrot, Mr. Worgan, Mr. Whitfield, Mr. Allen, Mr. Richards, Mr. Kelly, and Mr. Nathan. Mr. Griffiths, Mr. Bridge, Mr. Callaghan, and Mr. Waller . . .
We are happy to inform our readers that several Amateurs had a meeting at Mr. Waller's on Wednesday night last for the purpose of making arrangements to get up a Concert of sacred music for the benefit of the inmates of the Benevolent Asylum. This laudable undertaking reflects great credit on the gentlemen concerned, and it is to be hoped that their praiseworthy desire to assist the indigent will be crowned with success. The oratorio in aid of the funds of the Benevolent Society came off, as announced, on Wednesday night; and to say that we were pleased, would but faintly convey our feelings on the subject; we were delighted and astonished. We confess that we previously felt some misgivings that a composition, so difficult as the Messiah, and one requiring such effective management, both in regard to the number and utility of the performers, would prove too great an attempt for the musical powers of our community. We are happy to say that our fears proved to be wholly without foundation, and we express not only our own sentiments, but those of every person with whom we have conversed on the subject, when we say, that the performance as a whole was such as to raise, in a very high degree, the character of our city, with respect to its musical powers . . . We were more particularly pleased with the recitative and song, "For behold darkness shall cover the earth," and "The people that walked in darkness have seen a great light," which were sung in great perfection by Mr. Waller. "The trumpet shall sound," would, we have no doubt, have been sung well by Mr. Griffiths, had it not been completely marred by the horn accompaniments, which seem fated never to be played in tune . . . THE ORATORIO. - The amount handed to the Committee of the Benevolent Society by Mr. Waller, the Treasurer of the Oratorio, after paying all expenses, was £57 8s. 5d.
. . . Mrs. S. W. Wallace, Mrs. Gibbs, Mr. Waller, Mr. Marsh, and Mr. S. W. Wallace, each and all, deserve a more detailed notice than we can afford to-day . . .
ROYAL HOTEL. CONCERT. MR. DEANE begs most respectfully to inform the Ladies and Gentlemen of Sydney and its vicinity, that he intends giving a CONCERT OF VOCAL AND INSTRUMENTAL MUSIC, At the Royal Hotel, George-street, on WEDNESDAY, 17TH SEPTEMBER, 1845. On which occasion he solicits their patronage. PART I ... 3. Song, "King Death," [Neukomm] with full orchestral accompaniments, arranged by Mr. J. Deane - Mr. Waller ... PART II ... 7. Song, "The Last Man," (by the earnest request of several parties) the orchestral accompaniments by Mr. J. Deane, Callcott. - Mr. Waller . . .
SCHOOL OF ARTS. Mr. James Johnson delivered, last evening, at the Theatre of this Institution, the first of a course of Lectures on the History and Science of Music, to a crowded and fashionable audience, who appeared highly pleased with the evening's recreation, more especially with the illustrative part - amongst which the most prominent features were "Leichhardt's Grave," by Mr. Waller; "Hark! hark the Lark!" and "Glorious Apollo." Some illustrations of ancient Greek music were also well received. One of the most purely gratifying soirés of the season was that, in the form of a Lecture on Music by Mr. James Johnson, on Monday evening . . . The lecture was a most interesting one, with a fine choir, headed by Mr. Waller, to assist in its illustration and development. The chief pieces were "Pindar's Ode," - " Glorious Apollo," - "Hymn to Calliope," - "Here in Cool Grot," - "Hark the Lark," - "Leichhardt's Grave," - "When I think of the Wrongs he has done me," - one of Paer's choicest gems, abundant of fine thoughts and still finer examples of their treatment - and "Hail to thee Mighty One." . . .
Mr. Deane's Concert on Wednesday evening was extremely well attended, and the entertainments were highly satisfactory . . . Mr. Waller's "Last Man" was a very wretched affair. In fact his voice, which is from the head, never had any charms for our ear, and in such an ill-constructed place as the Royal Hotel Saloon, it was particularly unmusical . . . THE firs and second parts, together with a portion of the third part, of Handel's Messiah, were given at the Victoria Theatre on Tuesday, for the benefit of the Commercial Reading Rooms and Library. The music had been got up under the direction of Messrs. Johnson, and the performers comprised nearly the whole of the available musical skill of the city . . . The chorus, "O thou that tellest," went passably well, but Mr. Waller's "For behold darkness, was a little darker, we apprehend, than the composer could have intended or wished. It is but fair to say that this gentleman was very useful in the choruses, for which alone his voice is fitted . . .
. . . Mr. Waller sang Handel's glorious, "For behold! Darkness shall cover the Earth"; and Pasiello's masterly, "Fall of Zion", spiritedly. Mr. Waller has a fine, mellow-toned bass voice, which, if it had been cultivated, would have qualified him to give effect, and to do justice, to any composition. He is a good timist, and generally sings in tune; but his very defective articulation, and (in particular instances) more than imperfect intonation, resulting from his evident ignorance of the art of managing his voice, disqualify him for solo singing. The vocal organs of the human voice are so beautifully and wonderfully constructed, that in nine hundred and ninety-cases out of a thousand, nature will point out to the singer the best method of producing, or rather, the proper channel through whose influence the various qualities of tone are as it were created; and any infringement on nature's direction for the creation of sound, must occasion impurity of tone. Here then is Mr. Waller's great stumbling block. He does not seem at all conscious that the tones of a bass voice should issue from the chest, (what the Italians term Voce di petto,) and that any attempt, with such quality of voice to produce sounds through the influence of the head - distinguished as Voce di testa - would be almost as preposterous as expecting a horse to trot across the ocean on the surface of the water, or setting a ship down on dry land to sail over the Blue Mountains! Mr. Waller most frightfully disfigures nature, when he aims at artificial sounds - we mean those sounds which he produces so repugnant to the laws of melody, and so excruciatingly revolting to the ear of the unfortunate listener: they are unearthly sounds - not such as we read of in Shakspeare, Pythagoras, and others, as being produced by the spheres above, but more like sounds we might imagine from the Tartarean Palace below. We have no desire to be severe on Mr. Waller. His voice is good, as we before observed, and, at this remote distance from England, invaluable to join in chorus; but we hope he will never again attempt to sing a solo, unless he sings so low that we may not hear him. SIR JOSEPH BANKS' HOTEL. BOTANY BAY. MESSRS. BEAUMONT AND WALLER beg respectfully to tender their earnest and most sincere thanks to the ladies and gentlemen who, by their patronage have kindly distinguished their establishment during the last twelve months, and in soliciting a continuance of the same, beg to assure them that the indefatigable care and study of all connected with the establishment will be most assiduously exerted to render it in every respect worthy of their future patronage and support. Messrs. B. and W. are fully aware that an advertised return of thanks is a manoeuvre to attract attention so generally adopted by all classes of tradesmen as to be looked upon as a mere form of words, with which the writer's sincerity had nothing whatever to do ; but they conceive the fact of their establishment having been honoured by the patronage of the most distinguished individuals in the colony, a circumstance peculiarly demanding the public acknowledgment herein made, and for which they cannot but feel grateful. Messrs. B. and W. take advantage of this opportunity also to lay before those ladies and gentlemen who have not yet visited the hotel, a short statement of the peculiar claims it possesses over every other establishment of its kind in the colony, and which have concurred to procure for it such pre-eminent distinction, as well as briefly to allude to those particulars which should always be prominent and characteristic features in the management and general conduct of an hotel, the proprietary of which aims at earning the support of the superior classes of society. Foremost on the list of its peculiarities, stand the many advantages consequent on its unequalled beauty of situation, commanding in a degree to be found nowhere else in the colony, all that is desirable in a marine residence, added to facilities provided for the enjoyment of a country life; these again are materially enhanced by the circumstance of the house being such a distance from the city as would have been chosen had distance been the only object, being something short of an hour's ride or drive, and still sufficiently far to hinder its becoming a rendezvous for that class of persons with whom ladies and gentlemen object to mix. Parties fond of the amusement of boating and fishing will be fully enabled to appreciate the convenience afforded for these purposes by the jetty, which extends one-eighth of a mile into the Bay. thereby ensuring perfect safety and comfort in embarking or disembarking without reference to the state of the tide. The jetty also affords a delightful promenade terminating in a stage on which are erected a sufficient number of seats to accommodate a large party. A boat will be kept constantly in waiting for the convenience of visitors. Should more than one boat be required it will only be necessary to give a few hours' notice to ensure their attendance. A safe and commodious bathing-house has been erected, with bathing-dresses, &c, when required. The stables are extensive, and afford accommodation for twenty horses. In connexion with the hotel, but sufficiently removed from the main building, to avoid the bustle of business, there is a neat cottage large enough to accommodate a family, and particularly suitable for an invalid or other person requiring quiet and retirement. The gardens and pleasure grounds are extensive and tastefully laid out, in them will be found some choice specimens of floriculture, there are also shady and agreeable walks in the parts not immediately under cultivation. A number of swans and emus, as well as some specimens of the forest birds, which are kept in front of the house, will afford amusement to persons who are not familiar with these varieties of the ornithology of Australia. Added to the general beauty of the bay there are some objects of particular curiosity, such as the monument to the celebrated French navigator, La Perouse, the Botany Tower, Captain Cook's Commemoration Plate, &c, all of which are within a short distance of the hotel.
. . . The eventful day arrived; and, from three till five o'clock a.m., the rumbling of vehicles and the clatter of hoofs was incessant throughout the town: almost everything that had two wheels and four legs was called into requisition, and both the Cook's River and Canterbury Roads were lined with helter-skelterers, pushing on for the convincing ground. 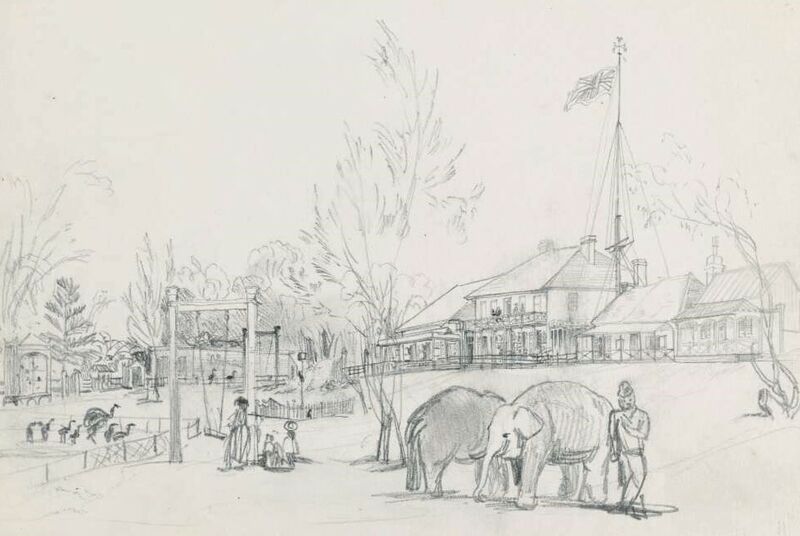 We who had tried those passages preferred doing the quiet to the Sir Joseph Banks Hotel at Botany, where a breakfast and a whaleboat were awaiting our arrival. At seven o'clock we reached that lovely place, which Messrs. Beaumont and Waller have rendered, at great personal trouble and expense, the most tasteful and delightful hotel in the vicinity of Sydney. While indulging ourselves in taking a view of the zoological collection of these gentlemen, we were informed, to our infinite consternation, that the aboriginal nautical individual, called Boatswain, had walked off with our marine without a "with your leave, or by your leave," and left us on our beam ends . . .
By our advertising columns it will be seen that Messrs. Beaumont and Waller, the enterprising proprietors of the Sir Joseph Banks Hotel, Botany, have engaged the steamer Eagle, for the purpose of affording their friends and the public a marine treat on New Year's Day. The vessel will proceed from the harbour to Botany Bay, and return again in the evening. Everything that can conduce to the pleasure has been provided by the projectors of the trip, and this, linked with the attraction which a view of the delightful scenery in the Bay and its vicinity, and the various amusements obtainable at the Hotel, will we have no doubt, procure the Eagle a full freight of those who are solicitous to throw care overboard and swim gaily down the holiday stream. The City Band has been engaged for the gratification of the lovers of music, and the votaries of Terpsichore.
. . . The success of Messrs. Beaumont and Waller, has hitherto been deservedly great; and from the satisfaction given to all classes of guests, whether casual visitors, or temporary residents, we opine that there will be a heavy run upon the "Banks" during the summer months. The only additional attraction wo can suggest to harmonize with the beauty of the gardens would be the bi-weekly attendance of a band; while the musical accomplishments of the amiable hostess, and Mr. Waller, frequently contribute to the enlivenment of the evening . . . The Honorable Captain Keppel of H.M.S. Maeander, having placed his splendid brass band at the command of Messrs. Beaumont and Waller for Wednesday last, those gentlemen on the previous evening mounted a splendid entertainment, in the beautiful grounds attached to their hotel; and notwithstanding the necessarily brief publicity which they were enabled to give to their intentions, the gardens were crowded far beyond expectation. The services of the Ethiopian Serenaders were retained at a moment's notice; the sable gentlemen arriving express from Parramatta about noon, where they had on the night before performed gratuitously to a crowded audience in aid of the funds of the Benevolent Society. A platform was speedily constructed in the enclosure sacred to the gambols of the kangaroo, and a programme was immediately issued in three parts, an hour intervening between each. An excellent luncheon was spread in the extensive saloon which had been prepared for the fete on Easter Monday, and a goodly company sat down to the feast, gladdened by the harmonious strains of the gallant Maeanders who, in the early part of the day, played some of the most popular overtures, and subsequently numerous quadrille sets, to which the lads and lasses of the city blithely footed it under the able directorship of Signor Carandini, M C. (not Member of Council.) The company were in the highest degree select, numbering probably between 400 and 500 persons who, we will venture to say, enjoyed themselves not a whit the les from the suddenness with which they had been required to "hie to the revel." A brilliant display of fire-works in the evening cast a parting radiance upon the scene, leaving still darker the homeward road to which most of the party immediately betook themselves. We are informed that it is the intention of the proprietors of the Sir Joseph Banks to give another fete on the 24th inst., the anniversary of Her Majesty's birth and we cordially wish them even greater success than has hitherto attended their spirited catering for a day's relaxation from the sterner cares and duties of city life. The only drawback to the enjoyment of the return home was the absence of the "Moon," as the worthy landlord of the London Tavern observed to his "confidential." MR. MARSH'S CONCERT . . . Mr. Waller sang, "England, glorious name," in capital style, without the military Band accompaniments; and this without was fortunate, as the Band entirely destroyed the effect of Miss Sara Flower's Rataplan, &c., &c. But, despite this, the Concert was eminently successful. PARRAMATTA. THE CONCERT. - Though the evening was wet, Mr. Stanley's concert was very fully attended. Mr. Nash's large room was well filled, and the performers must have been gratified at the flattering manner in which the various pieces were received throughout the evening. Mr. Stanley began with the overture to the "Gazza Ladra," on the piano, which he played in masterly style. Mr. Waller sang the "Ship on Fire," and at a later period of the evening the "Newfoundland Dog." These are of the Maniac School, and might please those who find pleasure in seeing amputations. His voice is full and mellow, and he sings with good taste and correctness. His "Largo al Factotum" was admirable. Miss Sara Flower's "Te m'abandoni" was by no means a show-piece to the debutante; but the duet from Tancredi left no doubt as to the character of her voice - it is like one of those boy-voices that one meets with once in one's life, and remembers for ever after; so clear, so full, and nervous, and of such volume and compass . . .
MESSRS. STANLEY AND WALLER'S SECOND ENTERTAINMENT. - In consequence of Mr. Waller suffering from a severe cold, the second of these entertainments, which had been announced to take place on the 20th instant, was indefinitely postponed, which caused no little disappointment to many parties who, influenced by the fame of the first, had determined not to lose the second opportunity, and who anxiously awaited Mr. Waller's recovery. To our great surprise, without any prior notice having been given, we saw it announced in Tuesday's Herald that the second entertainment would take place that evening. Now this was very unbusinesslike, and evinced great want of judgment; for it is, we believe, almost the universal practice in our busy community to skip over announcements of this nature, and leave them for the evening's reading. The consequence of this blunder was that instead of the overflowing house which we are sure would have greeted them, had greater publicity been given to their intention, these admired artists performed to a house not more than half full, which circumstance, together with a slight evidence that Mr. Waller had not quite recovered, caused the evening to pass off somewhat less spiritedly than we anticipated. Nothing, however, could have been more gratifying than the determination evinced by all the gentlemen (and indeed by some of the ladies) present to make up for the deficiency in their numbers by the fervency of their applause. Mr. Waller sang "The Ship on Fire," "England," "The Lugger," and Rossini's inimitable buffo song "Largo al factotum," with the truthfulness, and manly energy which is his peculiar characteristic, and, by his powerful declamation and artistic execution, drew forth the warmest demonstrations of delight from the audience. To us indeed it appears almost incredible that such perfection in the science should have been the result of no better a musical education than the colony affords, and it is but fair to argue that where so much has been effected in the face of so many disadvantages, the natural capabilities must be of a very superior kind. Mr. Waller also sang Nathan's "Oh! for the Olden Time," which, although scarcely known before, will, we predict, now become a popular song - it was most enthusiastically encored. At the first entertainment Mr. Waller proceeded each piece with a few introductory remarks, which made a pleasing variety in the entertainment. On this occasion printed programmes but poorly supplied the place of these remarks. We would suggest a recurrence to the original plan in this respect, as more likely to give general satisfaction. Mr. Stanley's brilliant performance on the piano-forte fairly astonished the audience; which is technically called delicacy of touch, he most delightfully exemplified, and the style and vigour with which a fantasia, by Hertz, was given, was undeniable evidence that not only is Mr. Stanley the best accompanyist we have (which all the profession admit), but that he is, to say the least, unsurpassed as a brilliant solo player. It will be seen by reference to another column that Messrs. Stanley and Waller intend giving their third, and, we regret to add, LAST entertainment (for a season) on Wednesday evening next, when we sincerely hope they will receive that amount of encouragement they so truly merit. MUSICAL STAR. - Mr. Waller, a performer who has earned golden opinions from the musical population of Sydney, may shortly be expected to arrive in Melbourne, where he proposes to give a series of concerts. If we may judge from the favourable notices which have appeared in the Sydney journals respecting this gentleman's performances, Mr. Waller is to all intents and purposes a star of the first magnitude. As was to have been anticipated from the popularity of the "bénéficier" and the character of the entertainment provided for his patrons, the concert of Mr. W. J. Cordner, at the Exchange, last evening, was attended by one of the most crowded auditories we remember to have witnessed within the building; every available spot in the Hall and the adjoining reading room being occupied by attentive listeners; and thanks to the excellent arrangements (for which, we believe, we must thank the very attentive Secretary), not the slightest discomfort was experienced. The arrangement of the station for the chorus, over the eastern entrance was very effective, but the organ was so miserable an instrument, that Mr. Packer was reluctantly compelled to make use of the pianoforte for the accompaniment to the florid music of Hayden. The first part of the programme consisted of sacred music from the works of Handel, Spohr, Haydn, Rossini, and Mendelssohn, of which the air and chorus from Spohr's "Last Judgment," and the recitatives and chorus from Mendelssohn's "Elijah," undoubtedly were the gems of this portion of the entertainment, both as regards the genuine worth of the compositions, and their execution . . . Mr. Waller gave evident symptoms of having suffered from indisposition; the "Elijah" recitative was, nevertheless, powerfully executed . . . A patriotic song "Australia," written, composed, and sung by Mr. Waller was, of course, loudly encored. It is a pleasing and spirited composition, though reminding one of "Jeannette and Jeannot" . . .
PATRIOTIC SONG. - A patriotic song written and composed by Mr. James Waller, entitled "Australia," has been published by Messrs Johnson and Co., of Pitt street. The author is well known as our greatest amateur basso, and on the occasion of the benefit of the Philharmonic Society he sang this piece with sufficient effect to call forth a unanimous encore. The words and music are both unpretending, but combined they convoy the sentiment which the author desires to express. The song is set in the key of G sharp, with a full and spirited accompaniment. A much respected citizen, not less remarkable for his powers as a vocalist than distinguished for his private worth, has been suddenly called away from amongst us. Last Monday night, Mr. James Waller (of the firm of Beaumont and Waller), after a very brief but painful illness, expired at Burva-place, Botany Road, to the great distress of his family, and to the sorrow of a widely extended circle of friends. His death leaves behind him a melancholy void, which will long be appreciable; for his amiability of manners, and his large hearted philanthropy were in perfect harmony with his noble voice, so familiar to thousands, and so admired by all - and never so happily, so exultantly raised as when enlisted in the blessed cause of charity, or in the sacred service of religion. From his childhood James Waller evinced a singular taste for high class music, and developed vocal powers which, in spite of all difficulties, he assiduously cultivated, year after year, with a constantly increasing ability until in the path he chose for himself he achieved an unexampled success - a popularity of which his friends might well be proud. The music that he loved, and with which this community will associate his memory, was that of an elevated and classical character, whether secular or sacred. In the compositions of those great masters, whoso names are household words in England, America, and Germany, our late fellow townsman took an unwearied delight, and especially in that class of music wherein the genius of Handel is so endeared to all Englishmen - the sublime music of the oratorio - for the execution of solos in which his voice was so peculiarly adapted. Many of the masterpieces of Handel, Haydn, Mendelssohn, and the most eminent of our old church composers have here long found their fittest exponent in that voice now silent for ever - compositions it will be impossible again to listen to without recalling the grand sonorous tones, deep feeling, and profound expression with which the departed did justice to to their sweet and solemn beauty. James Waller delighted in sterling music, and devoted himself eagerly to its study, but always as an amateur, judiciously considering the gratification of his musical tastes altogether subservient to the main duties of his active life, as the head of a family and as a private citizen. Thus his character never degenerated into that frivolous inanity, earnest lulling, and oftentimes something worse, for which lovers of music occasionally render themselves obnoxious to the severities of hostile criticism. He seemed rather to be purified and elevated by his natural love for music, and he insensibly imparted to others those evident advantages which he had himself received from his devotion to that noble science. It would be well if all who study music loved it as wisely and as well as James Waller. The value of such a study, as an educating power and civilizing agency, would then, perhaps, be more universally experienced, and more unequivocally acknowledged. Mr. James Waller was a native of Manchester, in England, where he was born on the 7th of November, in the year 1819. He arrived in this colony, with his parents, when not more than seven years old and as, during his life, he never left the country of his adoption, he has generally been accounted an Australian. He received his early education from Mr. T. Cape (that veteran teacher whom so many gratefully remember) and he was afterwards sent to the King's School, Parramatta, when that institution was under the mastership of the Rev. John Forrest. He appears to have left the King's School at about 15 years of age, and, like most of our well-disposed colonial youth, began to take his part early in the battle of life. In this career it is pleasing to hear that he has not been unsuccessful, and that he leaves his numerous family well provided for. His daily avocations, honestly and energetically pursued, did not deter him, as we have already intimated, from a sedulous cultivation of his powers as an amateur vocalist, and from a study of music - in those days not so popular as now. He was connected, en amateur, with the old Sicilian Society [recte Cecilian Society], and after the star of that association had set, he joined the old Choral Society. At the termination of the career of that musical body, Mr. Waller gave his friendly aid and important services to the Vocal Harmonic, and to other societies which have from time to time been formed in this community for the cultivation of a popular taste for first-class music. His valuable assistance was frequently given to the Sydney Philharmonic, and to the present Sydney Choral Society. One of the last great public occasions when his voice was heard, was in the sublime strains of the oratorio of the "Messiah," at the close of the late Intercolonial Exhibition. Mr. James Waller's last illness was short and severe, and his death so sudden that his friends have all been affected by a very painful surprise. He was only last Sunday, to all appearance, in perfect health, and attended public worship, twice, in the Bathurst-street Baptist Church, to which congregation he belonged. In the evening he was, for some time, singing sacred music with his children and his nephews and nieces, in the house of his brother-in-law and partner, Mr. Beaumont. It was not until after retiring to rest, at about midnight, that he became very ill, with dysenteric symptoms and violent cramps in the stomach. Everything that the well deserved affection of relatives could do, or anxious medical skill could enjoin, was tried to relieve his sufferings, but with little or no beneficial effect. It was not, however, until the following morning that the symptoms became yet more alarming, and that his medical advisers, D. Fortescue and Dr. Sydney Jones, began to apprehend a fatal result. He became rapidly so much worse that he gradually sank, notwithstanding the active remedies that were applied. In the brief intervals of the paroxysms of pain, true to himself, he endeavoured to comfort his weeping relatives and sorrowing friends, committing his family to his long-tried faithful friend, Mr. Beaumont, with whom he had been connected by marriage, and by a business partnership extending over the space of eight and-twenty years, and never interrupted by one angry word. He died on Monday night, at eight minutes past 10, in the fifty-second year of his age. He leaves a widow and six young children. He was buried yesterday afternoon, at 4 o'clock, in the cemetery of St. Peter's Church, Cook's River. A large number of friends followed the corpse to the grave.
. . . We have had quite an apostolic succession, of fine singing Prophets in Sydney - Frank Howson, James Waller, Andrew Fairfax, F. J. Hallowell, Signor Foli, Charles Magrath, Douglas Powell, William Paul, Alec Marsh, Charles Rosenthal, Watkin Mills, and Andrew Black among the number. The three "Elijahs" who "stand out" are James Waller, Sir Charles Santley, and Andrew Black. 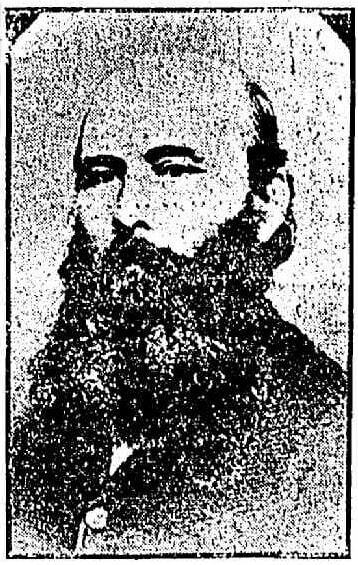 James Waller, who sang the part of the Prophet when the oratorio was performed in St. James' Schoolroom, Castlereagh-street (now the High School), well nigh 60 years ago, may be claimed to be an Australian. 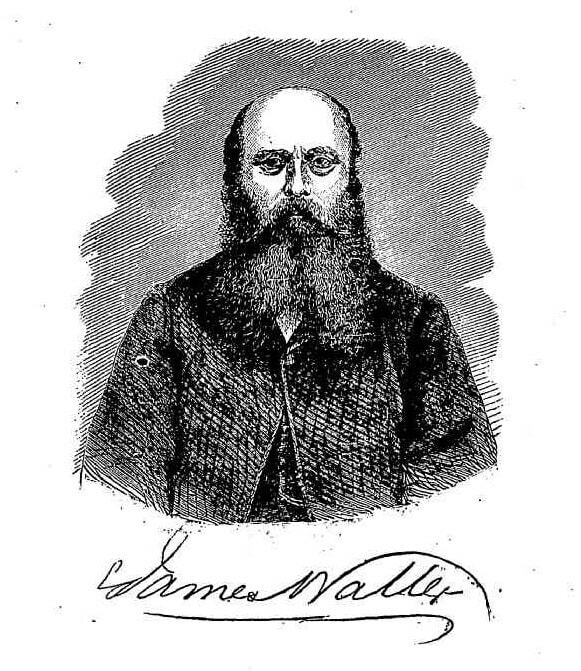 A native of Manchester, England, where he was born on November 7, 1819, Mr. Waller arrived in Sydney with his parents when he was seven. Educated first at Cape's School, and afterwards at The King's School, Parramatta, the boy made music one of his studies. On leaving King's School at the age of 15, he joined the choir of St. James' Church - the oldest church in Sydney - and for a period of five years prepared himself for the work that was before him as an oratorio singer. James Waller counted among his musical friends Catharine Hayes, Anna Bishop, Madame Wallace Bushelle, Madame Sarah Flower, Madame Carandini, Madame Lucy Escott, Isaac Nathan, Lewis Henry Lavenu, William John Cordner, Charles Packer, and Charles Edward Horsley. Mr. Waller was connected with the old Cecilian Society, and after the collapse of that musical body he joined the old Choral Society. At later periods he was associated with the Vocal Harmonic Society, the Sydney Philharmonic Society, and the Sydney Choral Society. He was sought after whenever such works as "The Messiah," "The Creation," and "Elijah" were performed. One of his last appearances in public was as soloist in "The Messiah" at the Exhibition Building, Prince Alfred Park, October 7, 1870. The DUKE OF EDINBURGH WAS PRESENT, with the Countess of Belmore, wife of the then Governor. The last appearance of the popular bass was in the performance of "The Creation" by the Sydney Choral Society in the hall of the School of Arts, Pitt-street. After a few hours' illness, the singer with the big, manly voice died at "Burva Place," Botany-road, in his 52nd year, on February 6, 1871. His remains were interred in the cemetery of St. Peter's, Cook's River. In 1842 he entered into partnership with his brother-in-law, Mr. Beaumont. The firm of Beaumont and Waller, builders and contractors was carried on until Mr. Waller's death. The celebrated Charles Edward Horsley, who came to Australia in 1866 [recte earlier], invited Mr. Waller to take a prominent part in the Musical Festival which was held at THE MELBOURNE EXHIBITION in April, 1867 . . .
On his first appearance in Melbourne the Sydney singer had encore honors for the "Largo al Factotum," from "The Barber of Seville.' This is what the "Argus" said on April 5, 1867: "Mr. James Waller, from Sydney, is proprietor of a good baritone voice - the best we have heard since Farquharson - and he has it in good control. He placed himself en rapport with his audience, who vociferously commanded the repetition of the solo." The "Age," among other complimentary comments, said: "Mr. Waller, who might appear with advantage on the stage in Rossini's opera, threw into the great buffo aria all the characteristic touches appropriate to the merry barber." The Melbourne "Herald" expressed the opinion that "the singing of 'Largo al Factotum' by Mr. James Waller was equal to, if not superior to, that of any basso who had appeared in Victoria." The "Herald" added: "Mr. Waller, who comes from Sydney with an enviable reputation as a basso, is an actor as well as a singer." During the Melbourne Exhibition concerts under Horsley's direction, Mr. Waller sang "O Ruddier than the Cherry," "Man's Misfortune," from "The Mountain Sylph" (Barnett), and his own song, "Australia," dedicated to the Volunteer Forces of Australia. He also sang the music of the Prophet in "Elijah," and the bass part in "The Messiah," Mr. Horsley conducting both the performances. In the Mendelssohn oratorio the artists associated with the Sydney amateur were Madame Carandini, Miss Rosina Carandini, Miss Fanny Carandini (contralto), Mr. Walter Sherwin (tenor), and Mr. Moxon. In the performance of "The Messiah" the soloists were Madame Wienbarg (a pupil of Manuel Garcia), Mrs. Fox, Miss Liddell, Mr. Melvyn (tenor), Mr. Moxon, and Mr. Waller. The Sydney singer was likened to Farquharson in his best day. As there are many readers of the "Sunday Times" who do not know anything about Farquharson, a little personal paragraph is here introduced. The distinguished English baritone-bass came from the Old Country in 1856. He sang with great success in opera and at sacred concerts and joined W. S. Lyster's opera company in 1861. All through his singing career Mr. Waller insisted upon being styled an amateur - a man who sang FOR LOVE OF MUSIC, not for money. He was "billed" as an amateur when he took part in our first Musical Festival at the Sydney University in 1859. The same announcement had to be made when he went over to Melbourne for the Exhibition concerts in 1867. Although a member of the Baptist Church - he attended the Bathurst-street Baptist Chapel - Mr. Waller assisted at some of the concerts in aid of the building fund of St. Mary's Cathedral 50 years ago, and he also sang on "special occasions" in Old St. Mary's. The late Archbishop Polding was a friend as well as an admirer of Waller. In the musical work which was done by him, apart from the concert platform, Mr. Waller was greatly helped by his wife - a sound musician and a fine pianist. The Waller family is now represented by two sons and a daughter - Mr. J. C. B. Waller, organist and choirmaster, Mr. Sydney Waller, and Mrs. W. P. Powell, of North Sydney. The late Frank Waller, a baritone singer, and postmaster at Mosman, was also song of the man who had his full share of honors at the Musical Festival in the Great Hall of the University fifty years ago. Mr. J. C. B. Waller, who retired from the position of organist and choirmaster at the Presbyterian Church, Ashfield, a few weeks ago, was for 25 years organist at the Congregational Church, Burwood . . .
Added in a later hand: "Dedicated to the Volunteer Forces of Australia"